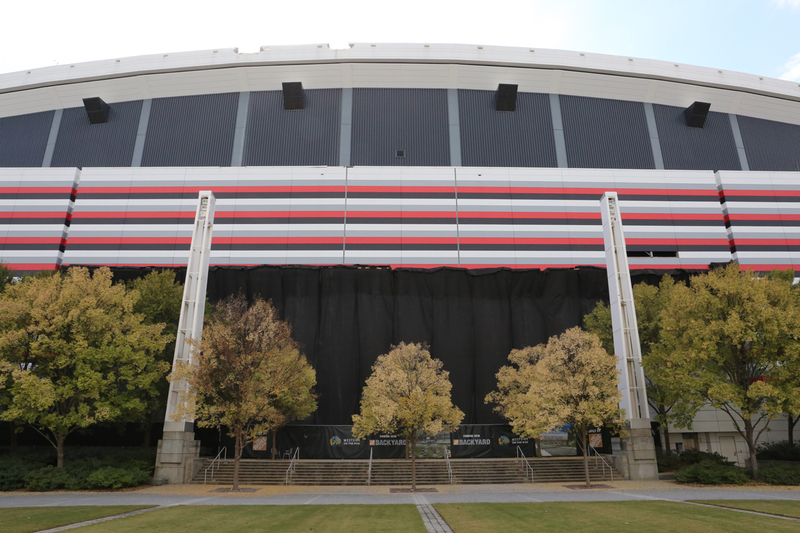 The demolition and clean-up of the Dome is part of the $1.5 billion pricetag for Mercedes-Benz Stadium. Though the actual detonations at 7:30 a.m. Monday will take just 12 seconds (plus another three seconds for the walls to come down), workers will be onsite for three months cleaning it up. The Home Depot Backyard, as it’s been called, will be ready for use in time for the Falcons 2018 season. 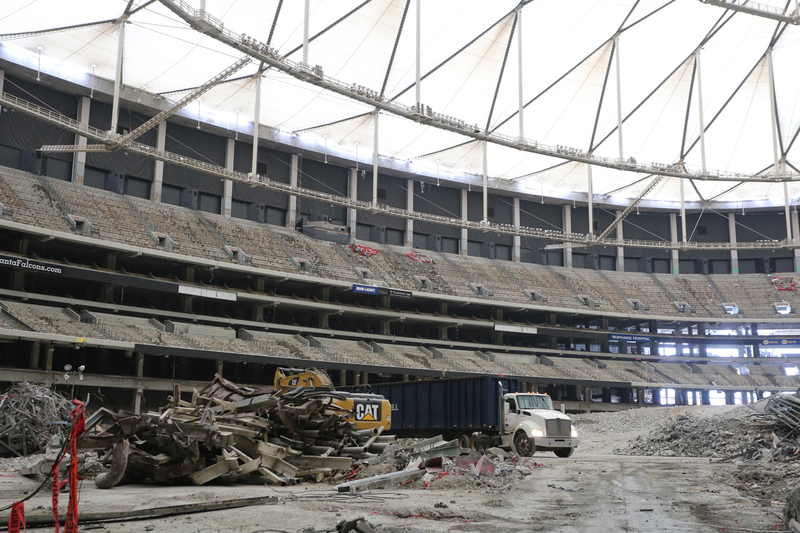 The Falcons sought bids from demolition companies all over the world, finally settling on Pettigrew to wire the Dome for explosives, and Adamo to do the set-up and cleanup. The two companies have been on the job for more than a year. 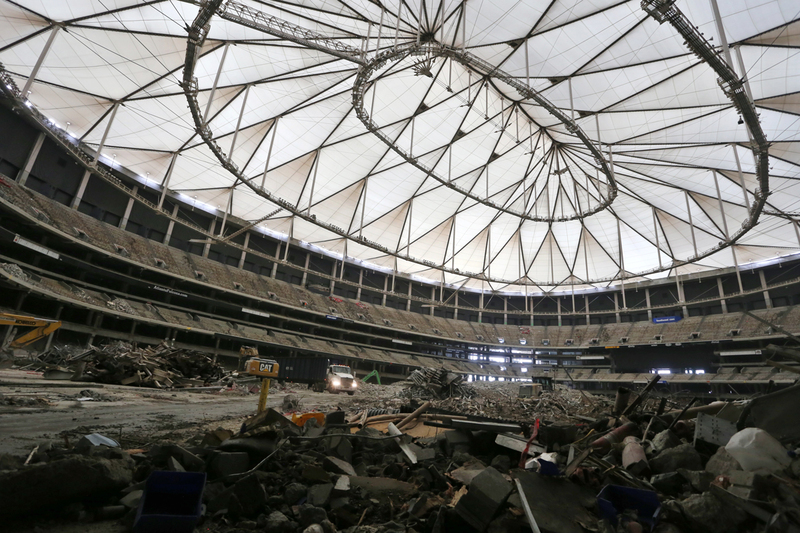 Anything that can be detached or moved inside the Dome is gone—the chairs, the chillers, the scoreboards, the turf. 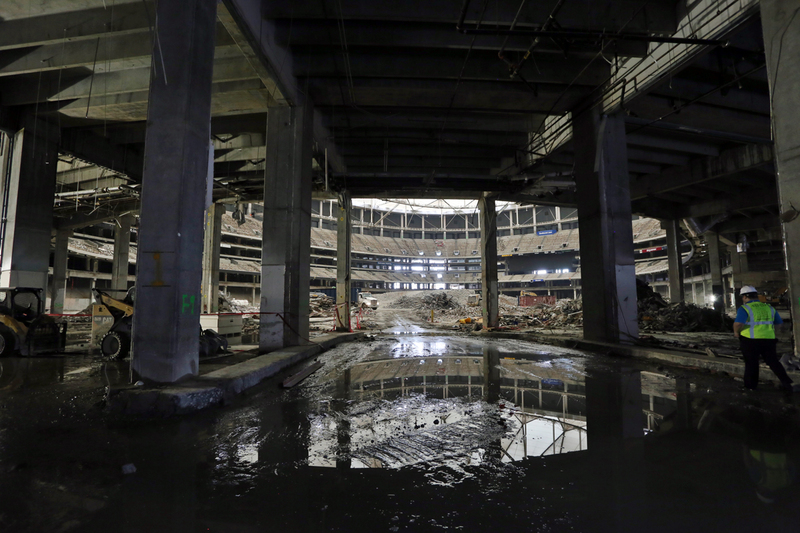 All that is left is steel and concrete—250,00 cubic yards, in fact. More than two tons of explosives (4,800 pounds, to be precise) have been positioned throughout the stadium’s interior. 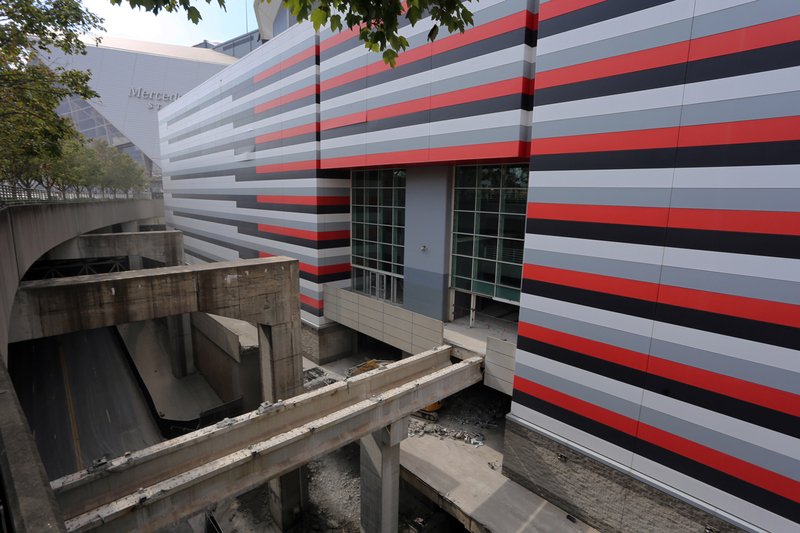 Dynamite has been positioned into holes drilled strategically within the concrete pillars. Which side the dynamite is on affects which way the pillar will collapse. The “ring beam”—to which the roof is attached by cables—has been wired separately with “shape charges,” which are C4 plastic explosives designed to detonate in one direction. The tension from the cables will draw the ring beam inward at the time of implosion. 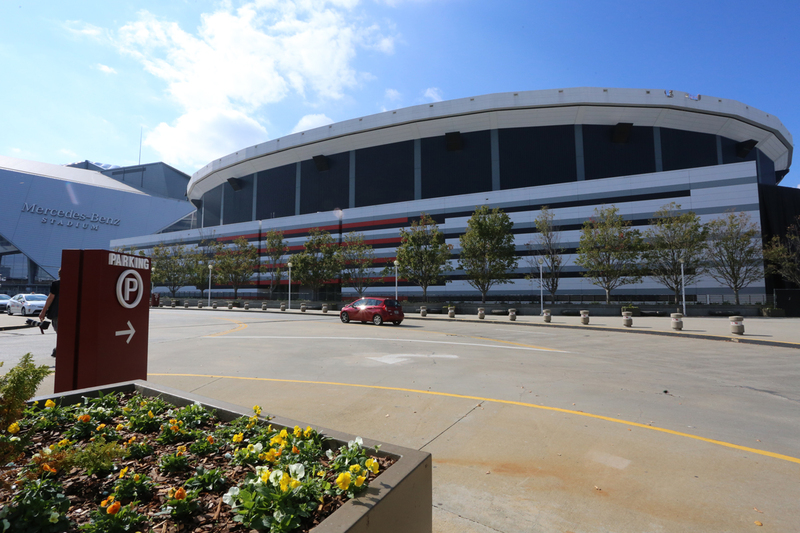 No more than 50 feet of bedrock separates the Georgia Dome from the MARTA line, which itself sits just five feet below the surface. 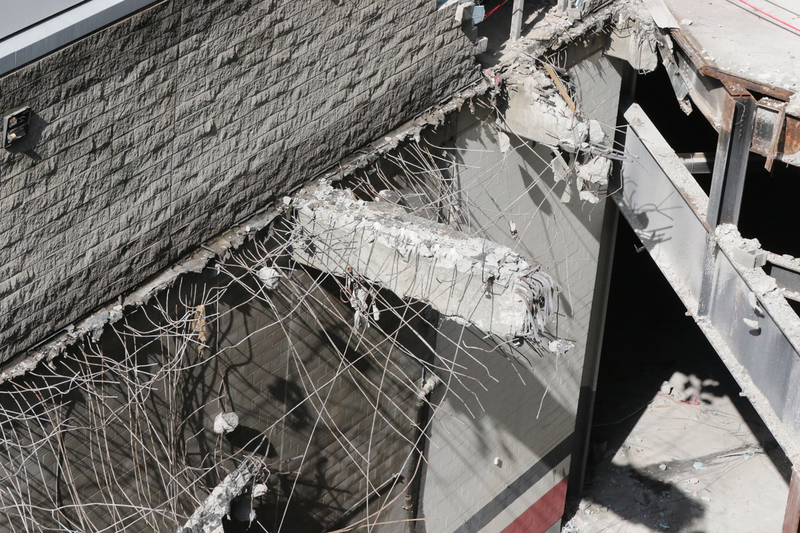 Engineers have positioned seismographs within the line and station to ensure that the shocks aren’t strong enough to damage any of the MARTA tunnels. 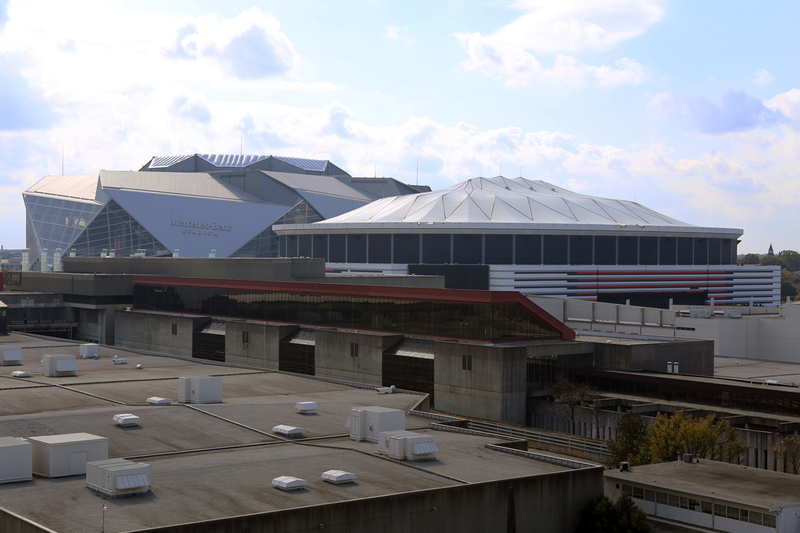 The Georgia Dome sits lower than Mercedes-Benz Stadium. Over the three months of clean-up, crews will crush the concrete into pieces six inches in diameter and smaller and spread it over the terrain. The concrete will provide a 12-foot base, over which will ultimately be poured sand and then finally topsoil and sod. 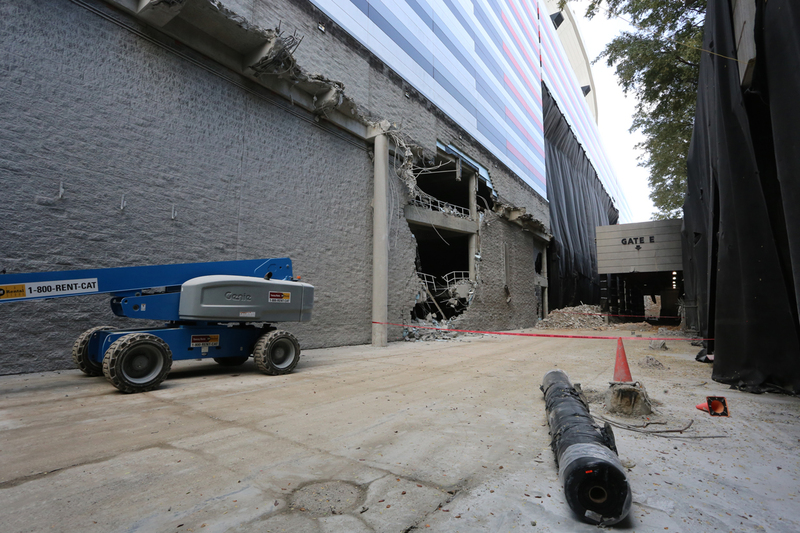 The resulting park will still be below the level of Northside Drive. The dust cloud will be big and is expected to leave a layer of dust as far away as a quarter-mile. Who will hit the button? Steve Pettigrew, from the company that wired the Dome with six miles of detonation cord and a mile of electrical connections. It’s not a red button, either. It basically looks like an old Nokia cell phone. Here’s an animation of how the implosion will look.